The Loog guitar is an ideal kids guitar for any budding young rock star. Loogs are strung with the treble strings on a regular guitar and are to the exact same tuning, meaning that kids learn a simplified version of the chord shapes on a regular guitar. For younger kids, holding and gripping a six string instrument is simply not possible due to fact that the strength required to hold down a chord is not developed in younger students. A true kids guitar simply put, is an instrument that they can actually play, which is the reason that the Loog was developed. The Loog Mini guitar is the perfect size for kids from age 3 to 7 or 8, where the Electric Pro and Acoustic Pro are musicians of any age. There are more that just the thickness of the neck that make the Loog a perfect guitar for kids. The short scale and neck mean that kids can easily reach the first fret and the body shape fits perfect in a young child’s lap. The body is made from real basswood, while the neck is a smooth maple finish leading up to quality machine heads that hold the tune perfectly. The Loog comes with an educational app that has a number of really cool features that will nurture your kids passion for music. Learning on a Loog is as simple as 1, 2, 3, three being the number notes comprising a triad. On a piano it only take you can make any major or minor chord with 3 simple notes, where as on a six string guitar, a full is comprised of two triads. The Loog simplifies the chord to its basic shape, making it much easier for the beginner to play. 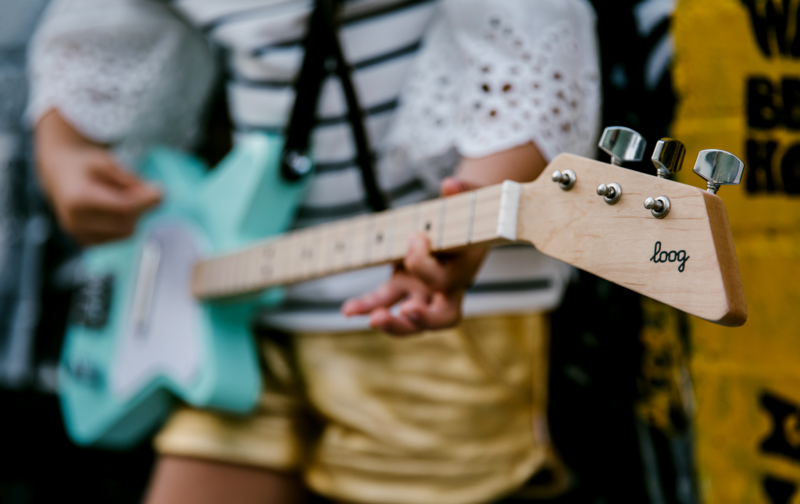 Kids can play simple note songs or rock out with their favourite artist on the Loog App. It is recommended that kids wait until they are 3 on a Loog to start playing and it is best to start with simply rhythm and strumming patterns. It is amazing what kids can do once you put an instrument in their hands and it will certainly give them enjoyment for many years to come. And, if you have ever harbored a thought of playing yourself, what could be more fun than learning along with your child! Check out the full range of Loog Guitars here and find the guitar that is suitable for you and you kids.